CityCenterDC © 2019 CCDC Master Developer. All rights reserved. CityCenterDC and the CityCenterDC logo are registered trademarks with the U.S. Patent and Trademark Office. 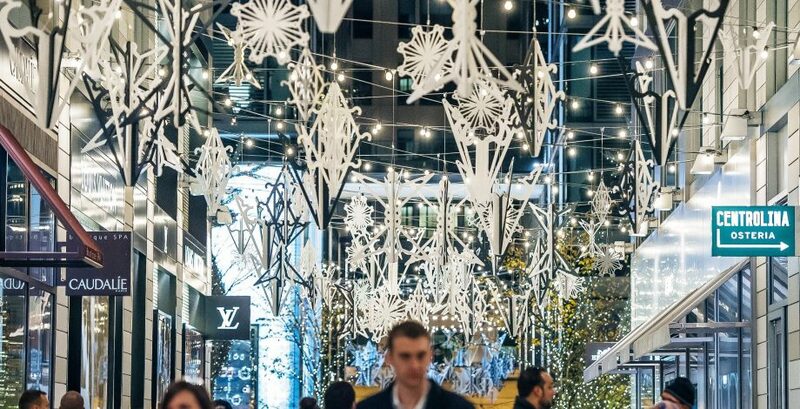 (WASHINGTON, D.C.) – CityCenterDC, the landmark, mixed-use development, has added an exciting new element to its eagerly anticipated annual holiday décor program. In addition to the city’s largest tree and reindeer display, CityCenterDC unveiled a new holiday art component along the main retail transverse of the neighborhood, Palmer Alley. The “Dream Closet” installation is transforming Palmer Alley into a whimsical corridor filled with dynamic ornaments, encouraging people to linger, photograph and shop in and around the space. SWATCHROOM, a D.C. based full-service creative design and fabrication studio, has taken the most basic retail iconography, the clothing hanger – a functional object essential to retail – and used it as inspiration to create imaginative, modern holiday ornaments. Filling the 550-foot long Alley, Dream Closet consists of 400 ornaments in various sizes, cut patterns and heights, adding to the visual complexity of the space and creating interest that is both awe inspiring in scale and simplistically beautiful. In addition to the Dream Closet, shoppers can also marvel at the third-annual holiday tree while visiting CityCenterDC. The monumental 75-foot American-made tree includes a dazzling six-foot in diameter manzanita starburst topper with 16 arms, as well as 4,525 ornaments adorned with 30,000 hand-crafted silver-leaves. In addition, 156,000 LED lamps on and around the tree will help light the night. Two 25-foot reindeer, made from 37,000 manzanita twigs, will also be on display in The Plaza at CityCenter for visitors to enjoy. CityCenterDC will be hosting a series of holiday events Fridays, Saturdays and Sundays through the holidays. For the full list of events, go to www.citycenterdc.com/events. SWATCHROOM is a multi-disciplinary design + art + fabrication firm based in Washington, DC that redefines the traditional design/build paradigm. We specialize in the translation of conceptual ideas + brands into experiences + built environments. We have an award-winning track record of providing authentic + wildly successful outcomes for our clients, which often sit at the intersection of high end interior design, custom fabrication, decorative finishing + art curation. OUR TEAM consists of architects, designers, artists, fabricators, finishers, graphic designers + branding experts. OUR BODY OF WORK includes the completion of restaurants, bars, hotels, art installations + residential projects in Washington DC, Palm Beach, Chicago, Aspen + Los Angeles; all characterized by a highly conceptual approach, innovative design solutions, consistent execution + a result that is truly one of a kind.